As I was walking down a strange back street of residential Buenos Aires on a cold dark night, towards the address of Colombian brothers, who I’d never met or heard of, on the recommendation of someone I’d never met, or heard of, it did cross my mind that if things went awry, I could be in trouble…. But I’d seen the menu for this Puerto Cerrado, and it was worth the risk. It turns out ilatina is a different kind of Puerto Cerrado. (Closed Door Restaurant) It’s not in the home of the chef, but in a beautifully decorated high ceilinged villa, and the ‘closed door’ part is that you must book beforehand and it’s always a set menu. A DELICIOUS set menu. It started with a white corn arepa with anise and Colombian hogao. They say the enjoyment comes with the taste and the presentation and the environment you’re in. From the first bite, all boxes were ticked. Next was bread. I tell myself not to eat the bread because I’ll get full before the ‘good stuff’ comes… but this wasn’t your average run of the mill roll. 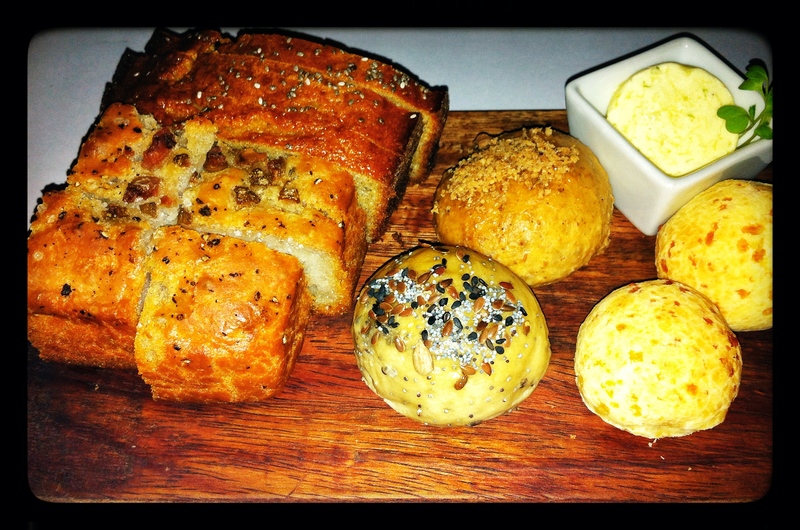 The bread basket had banana bread, chipá, coconut bread, focaccia with olives and mixed seeds, and lime and pepper flavoured butter. Chef Santiago previously had a restaurant in Bariloche, an Argentinian holiday spot in the foothills of the Andes. I don’t know why he and brother Camilo sold up there and moved to Buenos Aires, but my taste buds are thankful. My first official course was confit duck and quinoa tabbouleh in a rice paper roll, served with orange, lavender and ají panka sauce. The ají panka is a Peruvian pepper and I only wish I’d known about it before I left Peru. It’s a magical ingredient that makes you want to take photos of your food and tell everyone about it. 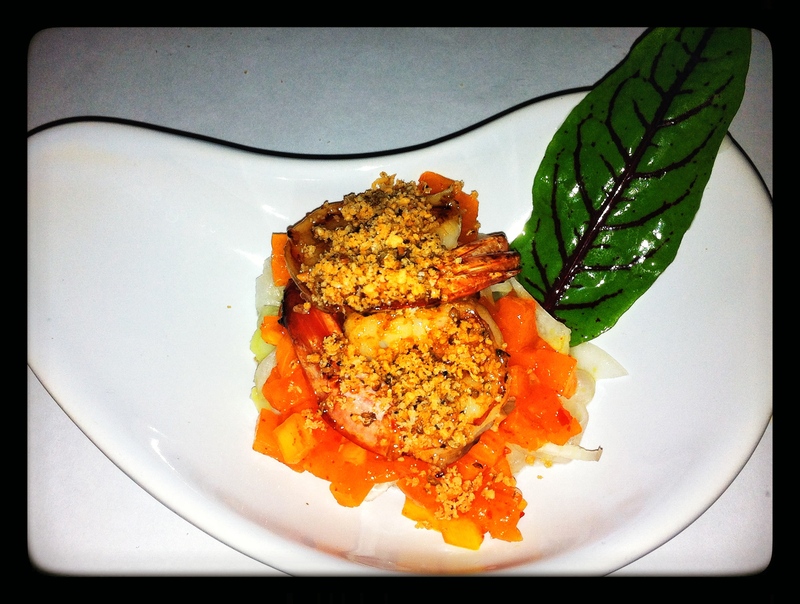 Next up was caramelised prawns with spicy pineapple and fennel. Living in Australia, I thought I’d tried prawns every which way you could, but these little beauties popped deliciousness in my mouth. Colombian ceviche was next on the menu. 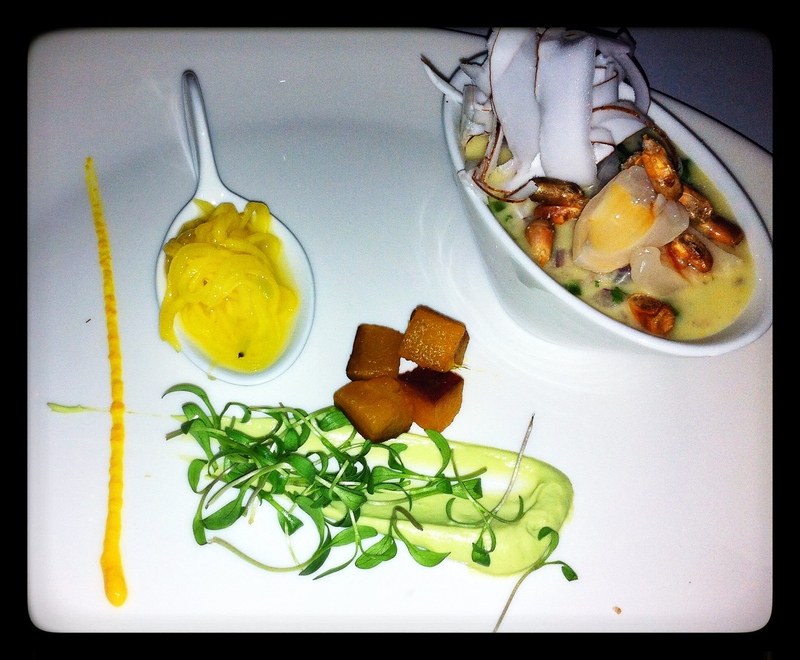 Barú style ceviche with seasonal fish, mango biche, coconut and lychee. I didn’t want this to end, and I wanted to drink the leftover coconut milky goodness. It took all my resolve to resist. With pretty much every morsel of flavour came another glass of wine, served with the perfect amount of knowledge about the particular drop from Camilo, the other owner and wine connoisseur. I’d describe them to you, but I confess I forgot the details. It was all very tasty though. 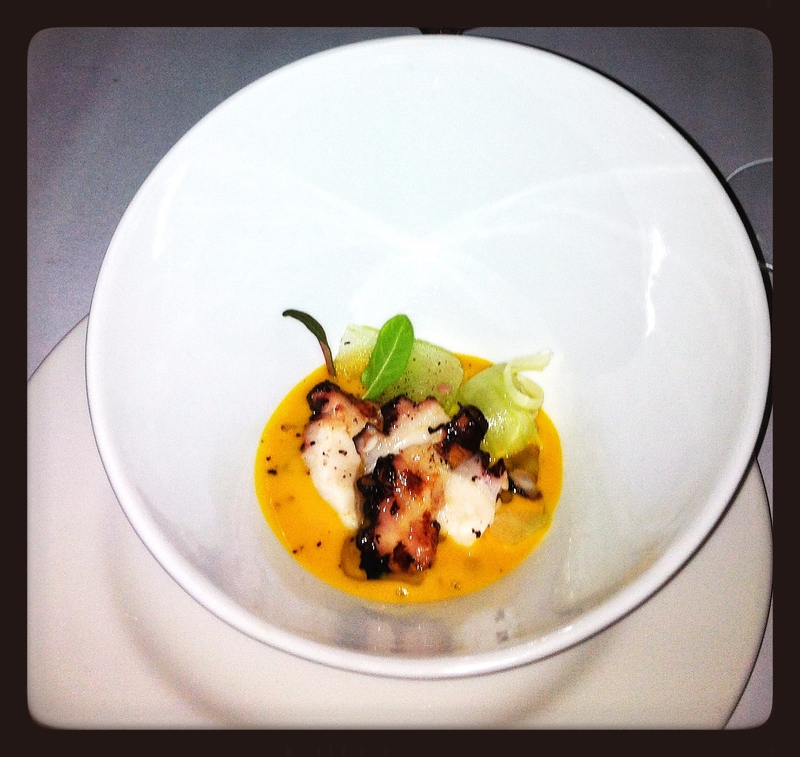 Next on the table was grilled octopus on pearl barley, basil, pumpkin cream and lemon grass. This may have had a dash of the magical Peruvian pepper as well. I wonder where I can buy that. Course number five was braised pork in coffee and sugar cane reduction. I swear I only looked at it and it fell apart in front of my eyes. So impressed was I with this, that I forgot to take a photo, (must not have had Peruvian pepper) so you’ll just have to take my word that it looked and tasted as good as everything else. 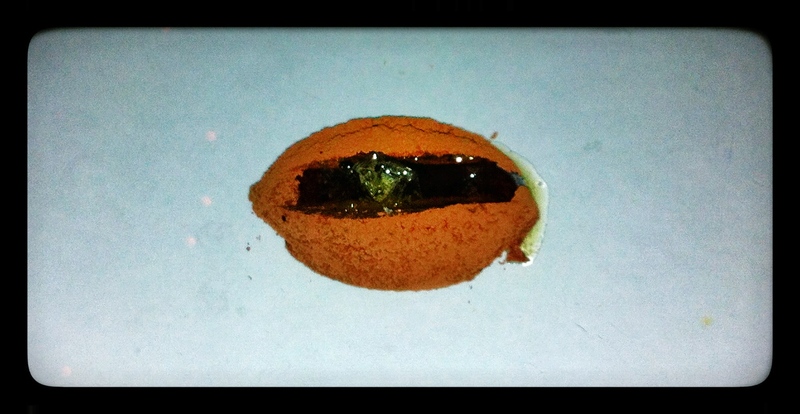 Dessert started with an Ecuadorian cacao truffle with sea salt and olive oil. It looks small but packs a punch of chocolately wonderful. 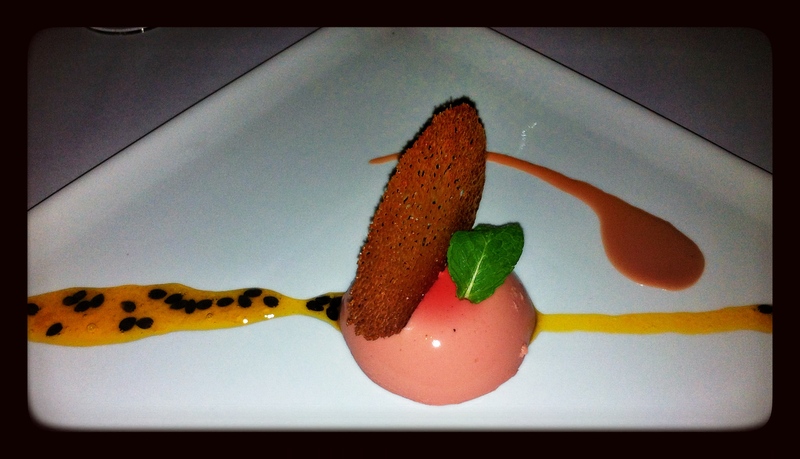 The Passion fruit and hibiscus flower panacota, was citrusy, fresh and light, and it looked so pretty. 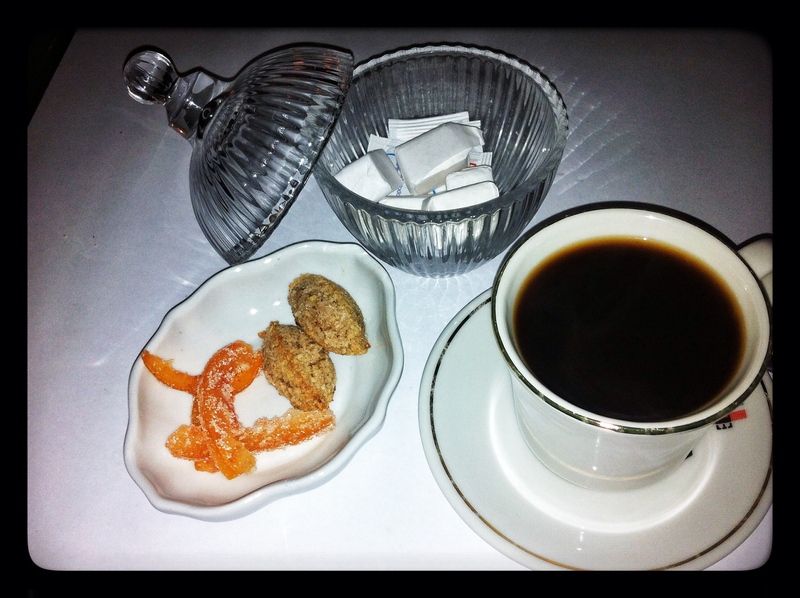 And then came the Colombian coffee, infused with cinnamon and cardamom and served with petits fours. A delicious end to an incredibly appetising night.